My son is 2 1/2 years old, and loves stories. His favorite book at the moment is A Fly Went By. In the book, a boy sits lazily by the lake and observes a fly passing. The fly in turn is pursued by a frog, who is in turn chased by a cat, and so on. Each has a similar pattern. With some amusement one evening while reading A Fly Went By, I realized that this style exhibits quadratic behavior. That is, the length of the song/story increases with the square of the number of actors/stanzas. 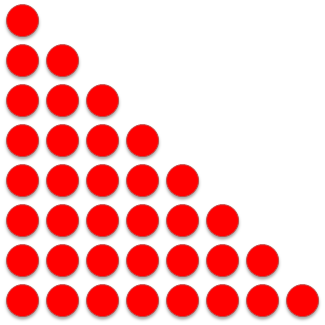 Arranged with an equivalent number of objects (dots, for example) on each line, the sequence forms a half-triangle pattern, as pictured at the top of this article. which, for large N, is dominated by the term N2. 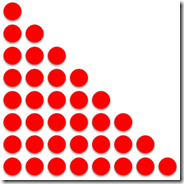 In computer science, an accumulation like this is frequently an indication of non-ideal algorithm design. In summary, if you double the number of actors / stanzas, the resulting book / song will be not twice, but four times as long. “24 days of Christmas” would be an excruciating 4 times as tedious to listen to, relative to the (already tedious) 12 days. It isn’t very surprising, then, that these songs and books generally tend to call it quits after 8-12 segments. In the future, my interview questions may include children’s books.